In an unusual move, Rolex released a brand new watch family in 2012: the Sky-Dweller. The move was unusual because it is rare for Rolex to introduce new complications into the market. As it result, it was the most anticipated watch featured in the Baselworld fair in 2012. The Sky-Dweller is totally unique in the Rolex line. It is the only model that sports an annual calendar as well as a GMT function to keep track of two timezones. This makes it one of the most complicated modern watches Rolex carries. Through a “Ring Command” (four-position setting) function on the bezel, the wearer turns the bezel to select the date, month, or time, and then turns the crown to actually set it. 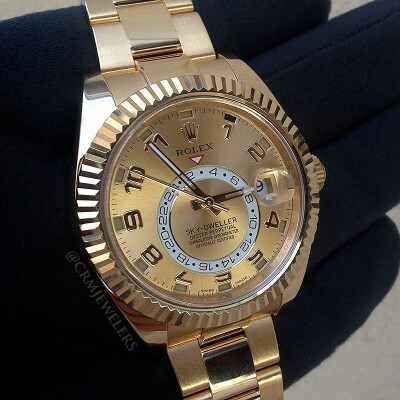 With a 42mm case size, the Sky-Dweller is one of the larger watches Rolex carries. Available in white, yellow or rose gold with either Oyster or leather bracelets, the Sky-Dweller is considered by many to be the most high-end Rolex model available.